The Chiari I malformation, also known as the Arnold-Chiari malformation, is a relatively common syndrome caused by displacement of the cerebellar tonsils below the level of the foramen magnum. Associated with the Chiari malformation may be hydrocephalus, spina bifida, and syringomyelia. In most instances, symptoms present in middle age. There are hundreds of articles about this well known malformation in the literature (see Pubmed). 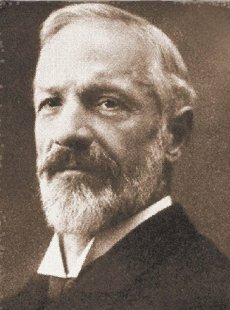 In the early 1890s, Dr. Hans Chiari, professor of pathological anatomy at the German University in Prague, used autopsy specimens to describe four congenital anomalies later termed the Chiari malformations (types I to IV). Of these, the mildest (type -I) is the most common one encountered in clinical practice. The Chiari malformation is generally thought to be present from birth (although usually nobody knows this for sure). However, rarely mild Chiari malformations may result from low spinal fluid pressure. (Payner, 1994). It seems reasonable to us that Chiari's may worsen gradually over life, and that a CSF leak might create a Chiari type of MRI picture as the brain droops down. 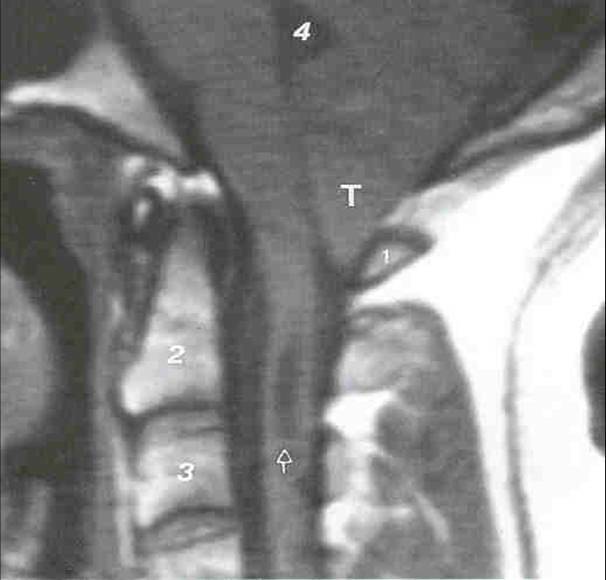 Figure 1a: Saggital midline MRI scan of person with Chiari-I malformation showing displacement of cerebellar tonsil below the upper margin of the foramen magnum 1b. 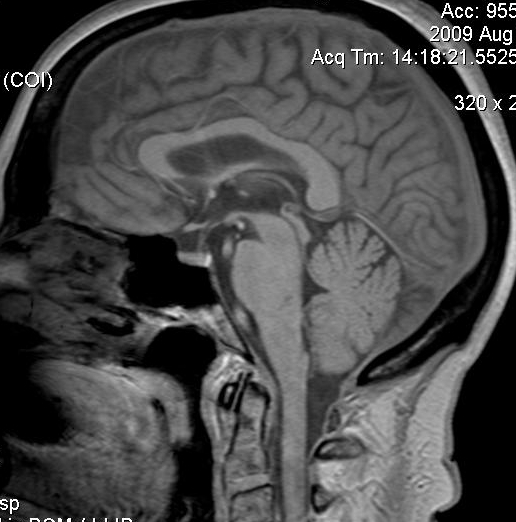 Normal MRI for comparison (obtained in 2009). Note also the improvement in MRI quality over 8 years. 1c. Person with a clear Chiari, but without any symptoms or signs at all. Having a Chiari on one's MRI does not mean that you are sick. 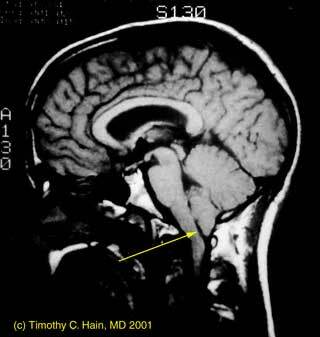 Rarely there is a hole in the brainstem/spinal cord associated with the Chiari malformation (see picture below). This is called a "syrinx". A more subtle form of this is a "presyrinx", which is a potentially reversible state of spinal cord edema caused by obstruction to normal CSF flow pathways, especially in the cervical region (Goh et al, 2008). 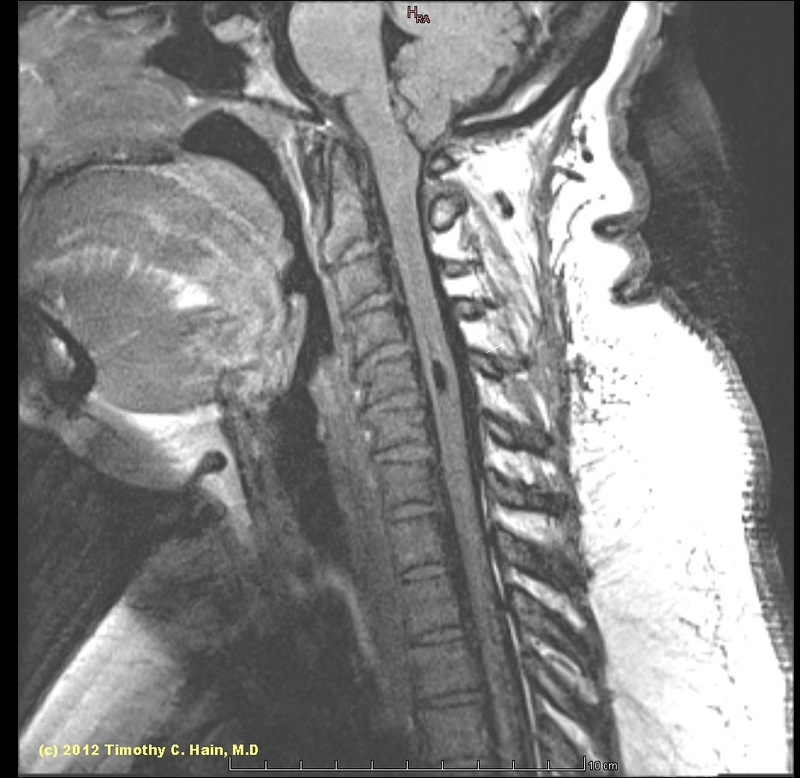 Syrinx in cervical spinal cord of individual with an Arnold Chiari Malformation. Image courtesy of Ruth Ramsey, M.D. Syrinx at C5 level in individual with Chairi Malformation. A closely related condition, basilar invagination may also be congenital or acquired (from arthritis). Ehlers-Danlos syndrome is another association with Chiari. Here the brain sags downward and this is not a congenital problem. Often when a person presents to the office with an undiagnosed Chiari, they have dizziness and headaches. This symptom complex triggers off a set of tests for inner ear conditions. 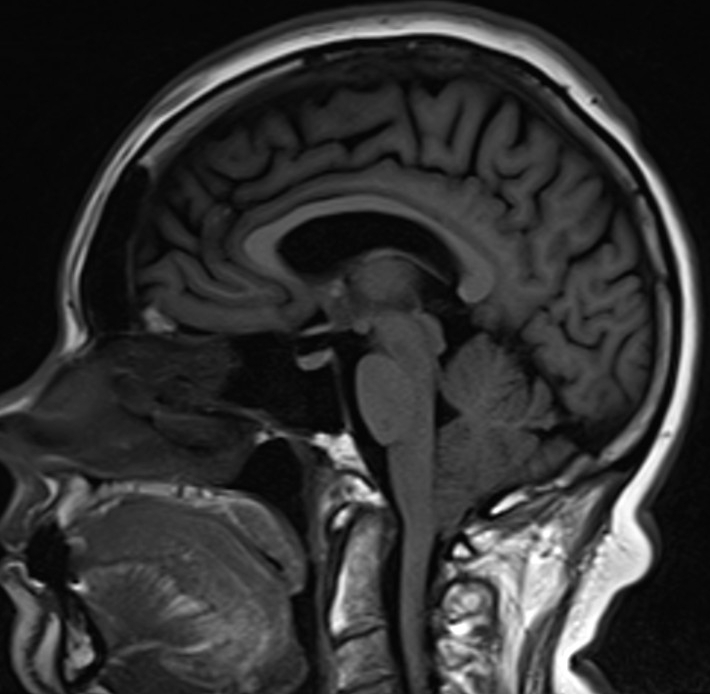 During the clinical examination or perhaps on the ENG test, downbeating nystagmus is noticed at some point, and an MRI is obtained (see above). The MRI establishes the diagnosis. Note that having an MRI that shows a Chiari, does not necessarily mean that the person is sick. In fact, most of the time, Chiari malformations are asymptomatic. Someone with a Chiari need not assume that neurosurgery is in their future. An abnormal MRI is not an indication for surgery - -surgery is done for illness, not for MRI findings. Weak downbeating nystagmus seen in primary position during ENG, in patient with a prominent Chiari Malformation. In this patient the findings on clinical examination were much more obvious than this minimal DBN seen on ENG. Much stronger downbeating nystagmus seen on eccentric gaze, in patient with a prominent Chiari Malformation. There is no rebound nystagmus -- he has a right-beating nystagmus that remains direction fixed on centering. The definitive method of diagnosis is with a T1 MRI scan of the posterior fossa, which documents the typical downward herniation of the cerebellar tonsils. A displacement of greater than 5 mm below the foramen magnum is considered significant. Cerebellar tonsil displacement follows a normal distribution (i.e. random scatter about a mean), and is mildly age dependent (Smith, 2013). Persons with lower tonsils tend also to have asymmetrical positioning, usually lower on the right (Smith, 2013). Occasionally Chiari symptoms occur in persons with lessened displacement of the tonsils (Milhorat et al, 1999). We are very unenthusiastic about surgical intervention in these patients (see later comments about the difference in enthusiasm between surgeons and others). Curiously, the author has encountered patients from time to time in which the reading radiologist did not notice that the person had a Chiari malformation. In once case, it was a very substantial one. Because of this, we think it is prudent for the doctors who notice downbeating nystagmus on examination, to review the images of their patient's MRI's. Symptoms suggestive of Chiari include posterior headaches, dizziness and ataxia (especially associated with straining), fainting with a cough, and weakness or numbness. A recent review of the otologic manifestations of Chiari in 16 patients indicated that 81% reported episodic aural fullness, 81% tinnitus, 69% vertigo, and 56% flutuating hearing. Headache was also common (about 80%). Movie of downbeating nystagmus (5 meg). This patient does not have a Chiari but has nystagmus that is typical for Chiari. Some patients with Chiari develop symptoms (dizziness mainly) on straining. This pressure sensitivity symptom is also shared by persons with superior canal dehiscence (SCD). Oddly, a recent report suggests that the Chiari Malformation is far more common in SCD (Kuhn and Clenney, 2010) than the normal population. We think that this report is likely due to sampling bias (i.e. this isn't generally true). 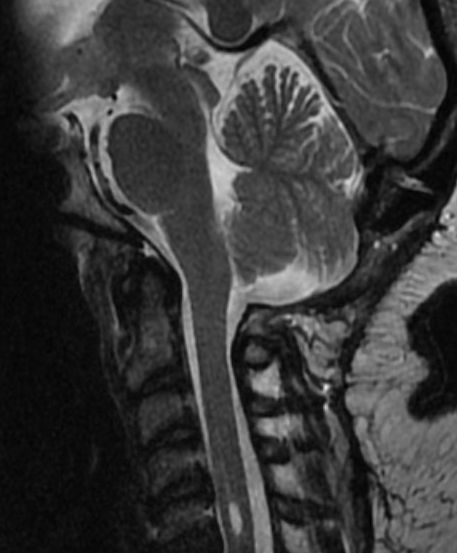 Nevertheless, we think it it is prudent to look for Chiari in SCD with an MRI. Signs of a significant Chiari malformation often include downbeat nystagmus (see above), poor pursuit for age, and alternating skew deviation. Poor and extremely asymmetrical horizontal pursuit in person with prominent Chiari. Poor vertical pursuit in person with prominent Chiari. Vertical pursuit is often poor in persons with no neurological disorder so the value of this is limited. Rebound nystagmus can often be seen with a video-ENG device where the eyes can be vewed in complete darkness. Movie of rebound nystagmus (43 meg). Occasionally Chiari patients will have sensorineural hearing loss (Hendrix, 1992; Kumar et al, 2002). Kumar reported that 69% of his patients had unilateral sensorineural hearing loss. This may be sampling bias as Dr. Kumar, being an ENT doctor, would naturally see more patients with hearing loss than other specialists. On the other hand, we have seen at least one patient with dramatic improvement in hearing after a Chiari malformation was decompressed. While in this case, a causal relationship between the Chiari and hearing loss seems very likely, the effect of surgery on hearing is so far not described. Positional nystagmus is common. It is most commonly downbeating or lateral beating. Persons with Chiari may develop vertigo after spending some time with their head inclined on their trunk. Thus the Chiari can cause cervical vertigo. In the Dix-Hallpike maneuver for BPPV, this may be recognized by seeing a delayed onset positional nystagmus. This nystagmus can also be looked for more specifically with the "vertebral artery test" -- a misnomer in this particular situation. Other causes of constant downbeating nystagmus that should generally be considered are migraine, paraneoplastic cerebellar degeneration, and anterior canal BPPV. Generally, the paraneoplastic differential is the most concerning as the nystagmus can be very strong and the consequences of missing a tumor high. Anterior canal BPPV nystagmus is not a major differential as it is present only lying flat (unlike Chiari). Migraine nystagmus is almost always weak although it is accompanied by headache like Chiari. A very few individuals with the Chiari malformation develop progresive neurological symptoms. This is most commonly due to an enlarging syrinx -- a hole in the spinal cord (see above). In our otoneurology practice in Chicago, it is extremely rare for us to refer patients for surgery. Rather, we generally make arrangements to follow people on a yearly basis. Having a Chiari on MRI scan is not necessarily a reason to have brain surgery (see treatment section below). See "Asymptomatic Chiari Malformation" for more about this policy. In our opinion, lumbar punctures, epidural blocks and related procedures that might cause a spinal fluid leak should be avoided whenever practical in persons with known Chiari malformation. The reason to avoid these procedures is that they may worsen the Chiari. In general, the best choice is "do nothing", as the alternative "Posterior fossa decompression" is somewhat invasive (open up the skull and make more room for the brain). As in most decisions, one should weigh risk vs benefit. In Chiari surgery, risk is substantial (your skull is opened). Benefit is minimal as Chiari's, in general, do not progress rapidly if at all. Before surgery (chiari and syrinx) After Surgery (syrinx is unchanged, Chiari is gone). This looks a little different because the before image is T1, and after is T2. The images above show pre and post surgery. There clearly is much more room for the cerebellum and lower brainstem post surgery. Complications of Chiari surgery can include spinal fluid leaks (hygromas), post-operative pain. Infections are rare. The large literature concerning treatment is large is almost completely the work of neurosurgeons. There have been several review articles concerning indications for surgical treatment (Haroun, Guarnieri et al. 2000, Tubbs and Oakes 2004). There are very few articles concerning conservative management. In other words, we think the literature is biased in favor of surgery. Decisions regarding surgery are best based on patient cost/benefit. The cost of brain surgery is substantial - medical risk, monetary cost, and time cost. The main benefit to Chiari surgery is prevention of progression of a condition that is rarely progressive. Chiari surgery is nearly always best avoided in persons who have no neurological signs referable to the posterior fossa. In other words, don't operate for symptoms of headache or dizziness -- only operate for progressive physical signs that are unequivocally due to the Chiari. Decisions regarding whether or not surgery is indicated are best made by non-surgeons (i.e. neurologists), as surgeons are often biased towards surgery due to their training, inclination towards active treatments, and other factors. It is safest to get a second opinion from a non-surgeon, unaffiliated with the surgeon. Ideally, ask a neurologist in a different city. An unbiased second opinion could avoid a lifetime of neurological injury. There is no medication that treats the underlying cause of the Chiari malformation (brain displacement downward). There are some medications for neck pain, headache and dizziness that may help with the symptoms. Physical therapy and chiropractic manipulation of the neck does not help the Chiari malformation. In fact, it may make matters worse. We have no objection to massage. Avoidance of activities that precipitates symptoms (such as straining, athletic activity requiring straining or involving forceful movements of the head on shoulders) is often useful. As examples, we would suggest that persons with Chiari malformations not lift heavy weights, or play football. Who should take care of Chiari malformation patients ? In our opinion, the Chiari malformation is a condition that should be monitored on a once/year basis by a neurologist. The reason for this is that while a neurosurgeon may ultimately operate on a patient with a Chiari, the huge majority of patients do not need brain surgery for the Chiari. We are generally unenthusiastic about asking neurosurgeons to make treatment decisions about elective brain surgery, as of course, neurosurgeons are trained and paid to do surgery. We think it is generally better to have non-surgeons decide whether elective surgery should be paid for by insurance companies. Ahmmed, A. U., I. Mackenzie, et al. (1996). "Audio-vestibular manifestations of Chiari malformation and outcome of surgical decompression: a case report." J Laryngol Otol 110(11): 1060-4. Albers, F. W. and K. J. Ingels (1993). "Otoneurological manifestations in Chiari-I malformation." J Laryngol Otol 107(5): 441-3. Chait, G. E. and H. O. Barber (1979). "Arnold-Chiari malformation--some otoneurological features." J Otolaryngol 8(1): 65-70. Ludwin SK, Norman MG. Congenital malformations of the Nervous System. A chapter in Textbook of Neuropathology (eds, Davis and Robertson) Williams and Wilkins, Baltimore. 1997. Haroun, R. I., M. Guarnieri, et al. (2000). "Current opinions for the treatment of syringomyelia and chiari malformations: survey of the Pediatric Section of the American Association of Neurological Surgeons." Pediatr Neurosurg33(6): 311-7. Hendrix, R. A., C. K. Bacon, et al. (1992). "Chiari-I malformation associated with asymmetric sensorineural hearing loss." J Otolaryngol 21(2): 102-7. Johnson, G. D., R. E. Harbaugh, et al. (1994). "Surgical decompression of Chiari I malformation for isolated progressive sensorineural hearing loss." Am J Otol 15(5): 634-8. Kuhn JJ, Clenney T. D Arch Otolaryngol Head Neck Surg. The association between semicircular canal dehiscence and Chiari type I malformation. 2010 Oct;136(10):1009-14. Payner TD, Prenger E, Berger TS, Crone KR. Acquired Chiari malformations: incidence, diagnosis, and management. Neurosurgery 1994;34:429-434; discussion 434. Samii, C., E. Mobius, et al. (1999). "Pseudo Chiari type I malformation secondary to cerebrospinal fluid leakage." J Neurol 246(3): 162-4. Smith, B. W., et al. (2013). "Distribution of cerebellar tonsil position: implications for understanding Chiari malformation." J Neurosurg 119(3): 812-819. Stovner, L. J. (1993). "Headache associated with the Chiari type I malformation." Headache 33(4): 175-81. Tubbs, R. S. and W. J. Oakes (2004). "Treatment and management of the Chiari II malformation: an evidence-based review of the literature." Childs Nerv Syst20(6): 375-81. Weber, P. C. and S. P. Cass (1993). "Neurotologic manifestations of Chiari 1 malformation." Otolaryngol Head Neck Surg 109(5): 853-60.